In All Star Karate you utilise the Wii Remote and Nunchuk controllers, plus the optional Wii Motion Plus, to perform punches, kicks and lightning fast blocks to advance through the Career mode. Alternatively, you can take on friends in Challenge mode or complete various tasks in the multi-player mini-games. Once you’ve selected your control scheme, you're faced with a very brief tutorial. The controls are extremely simple; shift your hand forwards to punch when the icon appears, hold down the B button and shift forward again to perform a kick. 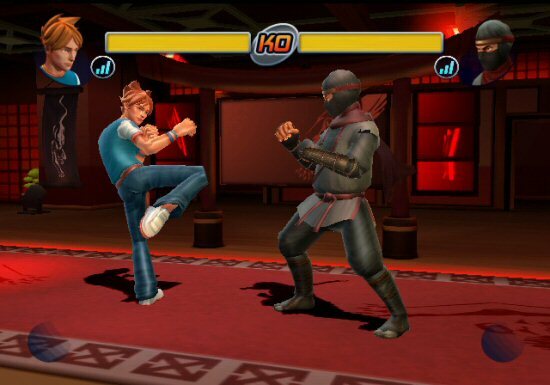 That is pretty much all there is to it - All Star Karate doesn't even get remotely close to simulating the real thing, which is such a shame given the potential of a motion-sensing karate title. Unfortunately, the control system that utilises both the Wii Remote and the Nunchuck isn't up to scratch - the Nunchuck just doesn't serve well as a motion capturing device at all and proves to be, more often than not, completely unresponsive. You can, however, use two Wii Remotes in conjunction with each other which proves to be the most responsive set-up when compared to the other available choices.